Today's custom wallpaper post celebrates vintage photography as an inspiration point for photographic wall murals. Vintage photographic images can come from any number of sources; antique shops, garage sales, or they may already be in your possession. Another great vintage photo resource is Wikipedia Commons, which has a large collection of royalty free vintage images that are perfectly suited for custom photographic wall murals. 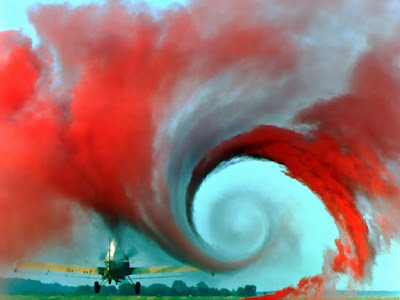 The image above is a shot by NASA, showing the vortex created by an airplane speeding along. 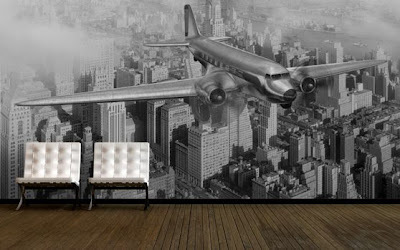 A very different take on an airplane in a vintage photograph, but just another example of how there is almost always the perfect image out there for a mural based on individual preferences. Great images. They would look great on Gazoomy as a Google background wallpaper!